Low tide at 4:55. Sunset at 4:44. The dreary December dusk descended with a breeze stiff enough to make my rake handle vibrate when held across the wind. The water-warmed wind wrapped around me like a September squall. Foam broke off the back bay waves and skipped onto the mudflat, fleeting beach demons dissolving in the darkening gloom. I got my dozen, then put three back. I had what I needed. Back home kale waited for me. Put clams in until opened. Scoop out the clams, chop up the meat, save the juice, and hold in bowl until all clams cooked. 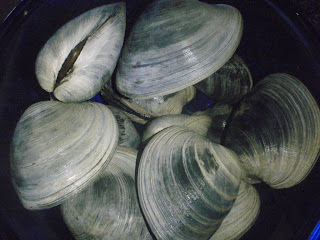 Once all clams cooked, dump chopped clams and juice back into the clam water and let simmer. Pour just enough olive oil into iron skillet to coat bottom. Rip up kale and toss into above in several handfuls--each handful should shrink into manageable size before tossing in the next. Toss in cup of half and half, turn off flame, and let set for 5 minutes. Serve with bread and Guinness.